Well, one good turn deserves another. So if, like Paul Krugman (and me, I think, though I hadn’t gotten as far as thinking through all the implications of what was happening when I posted the original piece) you take the view the Ukraine industrial output chart I put up yesterday is the smoking gun (or starter’s pistol, or line judge flag, or whichever metaphor works for you) that tells us that what we could come to call the second great depression may now have begun, then here are some more of those tell-tale charts to put in you pipe and smoke – or if , like Huck Finn that is your preference, to chew on. 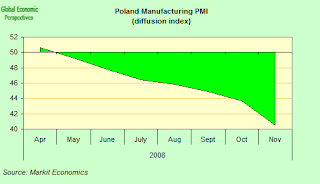 (Update: someone in comments has made the perfectly legitimate point that Paul Krugman may only be saying that a Great Depression has broken out in Ukraine, and obviously only he can say what he really thinks, but as far as I am concerned, since one of the hallmarks of the original Great Depression was a sudden sharp drop in output, sustained over a number of years, and in a large group of countries, accompanied in several cases by outright price deflation, then I do think that what we now have on our hands is something that looks more like a depression than a recession (or slowdown) is what we now have on our hands, and what makes me more or less sure about that is looking not only at what is happening in Ukraine, but at neighbouring Russia, and China, and so on and so on. The point is that Ukraine is not an isolated case – if it were then we would simply be able to say that a large depression had broken out in Ukraine, and that would be that. 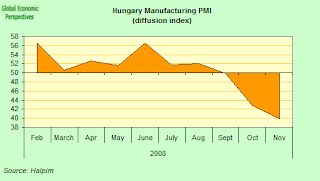 But since part of the explanation for this sudden drop in output in Ukraine is a lack of working credit, and since this credit drought has now spread across most of Central and Eastern Europe (see Russia here, Poland here, and Romania here), and since the by-product of the Ukraine situation is likely to be a whole cycle of debt defaults, which will certainly spread well beyond Ukraine’s frontiers, and since in the wake of those defaults banks will become even less enthusiastic to lend, well then it does seem to me that what is happening in Ukraine has some more general significance. I also certainly think all of this was not far from Krugman’s mind when he made the post, since what he wasn’t doing was simply (in true bloggie fashion) saying ha ha, look what’s going on over there. What he was saying is “watch out, this can come back and give us all a kick” – which again is what he was doing with his Japan work in the late 1990s, and it did. My feeling, and it is only a feeling, is that what he wanted to do was move the debate on, and up a level. We can’t address the kind of problems we are facing if we fail to recognise we are facing them, and one of our problems in responding to this crisis (and especially here in Europe), has been a consistent failure to recognise the importance of what was happening, and to take measures which were up to the challenge. What was it they used to say: Ninja mortgages, ha, ha, ha. I don’t see these people laughing now. Evidently, since history never exactly repeats itself, I am certainly not saying that the current crisis is going to last an entire decade, or end in a big war, or anything like that. What I am saying is that it has already made a place for itself in the history books, and already belongs to the class of large and unusual economic phenomena, and that we can learn a lot about how to handle our present problems by looking at the experience of 1930s. Of all of this I am absolutely convinced, and I have a pretty good idea that both Bernanke and Krugman are too, if you look at the constant references to those years in almost everything they say and do these days). Japan industrial output isn’t exactly falling at the same dramatic pace as Ukraine, but a 16.2% year on year fall isn’t to be sniffed at either, and this is what they informed us today happened in November. 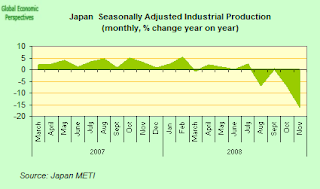 Worse still, according to Japan’s Economy Ministry output is expected to decrease by a further 8.0% between November and December, which, if accurate, will surely push the year on year decline in December over the 20% mark, not the great depression, but then again, not exactly enjoyable. 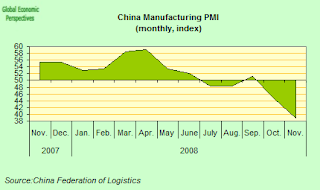 And exports, which drive the Japanese economy, were down by 26.7% in November. Even more to the point, deflation is baaack, or almost back, since “core” core prices hit zero (or 0.1% below current overnight BoJ interest rates) in November, and outright deflation surely isn’t far behind. You can find more detail on all today’s Japan data over at the Japan Economy Watch Blog, and for those of you who want some more deflation background on Japan, well, Krugman has the goods here (extremely wonkish). The slope of that line looks pretty telling doesn’t it, especially if you are into depression economics. 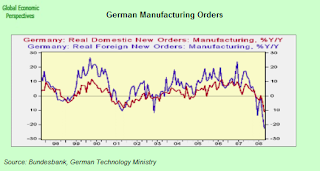 Then we have the November new orders chart, another shocker, and indicator of much worse to come, I think. I think this is largely true, if we mean by the periphery the UK, Ireland, Eastern and Southern Europe, but the periphery in a very literal sense always ends up biting the hand that feeds it, since German industry depends on exports to that periphery perhaps more than to anywhere else, so it is not surprising that once the periphery folds, the shock wave moves on in towards the centre. I don’t know if the blast which is about to hit Germany next year will count as a depression, but if it doesn’t, it is going to be a damn close call. And the hard part for Germany is when you get to ask yourself where exactly the new demand will come from to drive the exports? 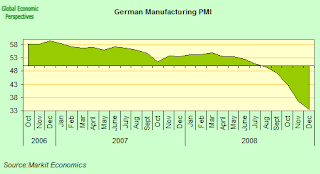 Moving off now towards the periphery, we have Spain to the south, where the money certainly has dried up, and with it internal demand for Spain’s manufactured products. 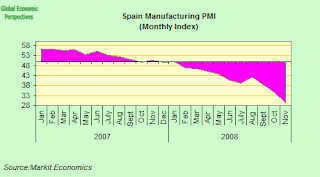 The November PMI showed Spanish industry contracting at an all time series maximum for any country. 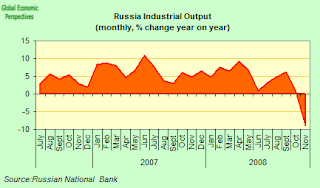 Moving on now to Russia, industrial output was down by 8.9% year on year in November, so it hasn’t yet reached Ukraine levels, but at the rate of contraction they are experiencing I wouldn’t be too confident that that state of affairs will last too long. So where does that leave us? Well basically I’m not sure. We still need to see more data. (Do I sound horribly like Jean Claude Trichet at this point?). 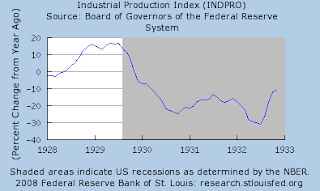 If we look at the chart for US industrial output which Krugman presents, the first thing which is pretty obvious is that the 1928-1930 boom-bust was a pretty rapid affair. 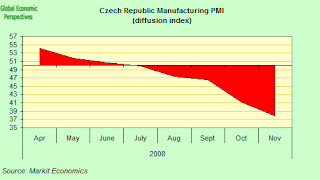 After that output dropped very sharply, going in the space of twelve months from a 20% expansion to a near 30% contraction, and the contraction continued at those levels until mid 1932, when the position started to improve – although all this year on year % contraction data is a bit misleading for non specialists, since to have a 30% contraction in mid 1932, following near 30% contraction in mid 1930 and (what) a 15% contraction in mid 1931 (taking into account base effects) then the drop is really massive, and I doubt even Ukraine (barring very worst case scenarios where the country simply disintegrates) will get this. But where this current output slump (or call it what you will) in a number of key countries already does resemble the 1930s more than any other drop in activity since (remember, Japan’s November fall in output is greater than anything that has happened in the entire lost decade-and-a-half – and the biggest since at least 1953) is in the sharpness of the drop, and in the sequencing of events. By sequencing I mean the fact that we have had a pretty dramatic financial crisis, which has lead to a generalised loss of confidence in the banking sector, and this in turn has produced a credit crunch, which is now working its way right through the real system. And nothing, but nothing, at this point, seems to be barring its pass. That is the worrying bit, and that is why I don’t think we are going to see a generalised “turnaround” in activity in 2010, or even 2011, this show is going to run and run, at least in some of the worst affected countries. And we still don’t know just how many icebergs there are lying out there for our convoy to hit. In particular, since we all just got the excess leveraging is bad, current account deficits are bad, exports are good religion, it isn’t obvious at this point just who the customers are going to be to drive any new expansion when it does finally come. Life, as we know, is always full of surprises, and we should ever be ready for them, for good or for ill.
Krugman didn’t say that there’s a second great depression thanks to the ukraine figures, he said there’s a second great depression in the ukraine. Not necessarily generally where his bets seem more hedged. OK. I take your point. But I wasn’t saying it either, until he put that chart up in that way. I suppose he can speak for himself about what he thinks, but basically, if you take it in the context of his view (which I agree with) that the bonfire has spread to Europe’s periphery, and that Ukraine is much bigger than Latvia, and that the contagion problem is going to be much greater – we have the twin storm of a total credit dry up and a massive contraction in the real economy, in one country after another, then call it what you want, but what we have on our hands is something very very special. Incidentally I am still adding charts here, so this is a post on the fly. All I wanted to say was that this site was very helpful with my research paper and to give a “Thank You” to Edward Hugh.